A Friend Calls, And A Best Friend Moves To Help When military parents are deployed overseas, it's often up to the other parent, or a family member, to care for their children. But what happens when there's no family around to help? For Navy operations specialist Sheena Sullen, that meant calling on an old friend. Along with caring for her own children, Jihan Sanders takes care of the children of her best friend, operations specialist Petty Officer 1st Class Sheena Sullen, while Sullen is deployed with the guided missile destroyer USS Mahan. Before bed, Sanders hugs Zaria Sullen-Polk, 8, while Sanders' son Darric, 9, and daughter Tashawn, 12, get ready to say good night. This story is from a series by The Virginian-Pilot called While You Were Gone, which looks at the lives of military families on the domestic front. When members of the armed forces are deployed, it's often up to the other parent, or a family member, to care for their children. But what happens when there's no family around to help? For Navy operations specialist Sheena Sullen, that meant calling on an old friend. Sullen was looking for options last fall as she prepared to leave her Virginia home for an assignment overseas. Her fiance had already been deployed. So Sheena called on a dear friend from her childhood — and asked her to make a life-changing decision. And Jihan Sanders answered the call. As Sanders said late last year, "My best friend, Sheena Sullen, is deployed. She left November the 7th, and I came here from Alabama to help her take care of her kids while she's away." 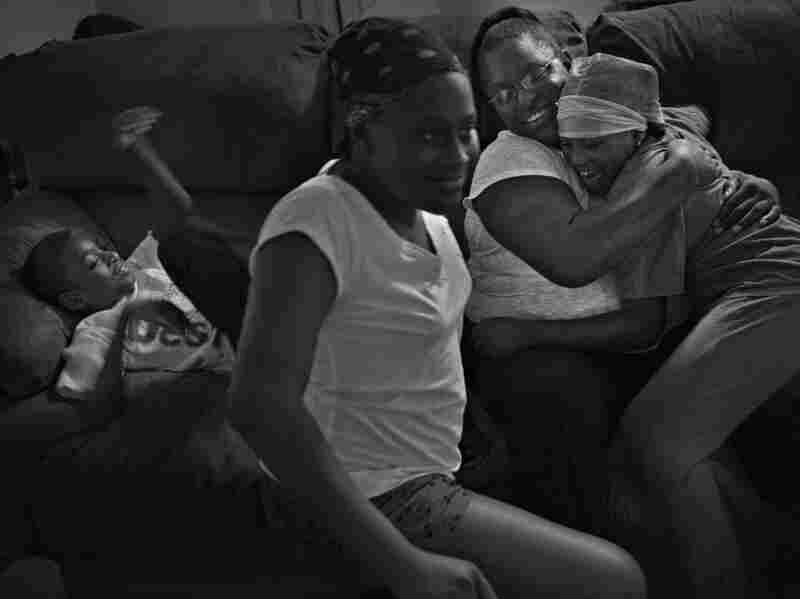 That decision has created a full household in Norfolk, Va. — Sullen's daughters, Dominique Sullen, 14; and Zaria Sullen-Polk, 8, now live with Sanders' two children, Tashawn, 12; and Darric, 9. On a Sunday afternoon, Sanders steals a few moments of peace while the four children play outside. It's the quiet time after church, before she helps with schoolwork and starts cooking dinner. Sanders' two kids dart about the apartment building's playground, while Sheena's son and daughter circle the parking lot on their bikes. The two women weren't much older than their children when they first met, in high school. "Our friendship just blossomed from there, and we were just inseparable." Sanders had no qualms picking up her family and moving them from Alabama to Virginia to take care of her best friend's children while she is deployed. Sanders' mother had abandoned her family, and her strict military father never allowed the children to have company. But Sanders says it was different at Sullen's house. "Her house was the more homey house," she says. "It was, 'Oh, hey baby, hey sugar — how you doing today?' It was just always life at her house, and I loved it over there." The best friends would sleep head to toe in Sheena's twin bed, dreaming about the future. They planned to enlist in the Navy on the buddy system. And when they returned, they'd live in one big house, with their husbands and kids. But things didn't turn out as planned. Sullen enlisted after having her son, and Sanders was left behind. "I end up getting pregnant, so she just went on to the military by herself," Sanders says. "I felt like it was the best thing she ever did. 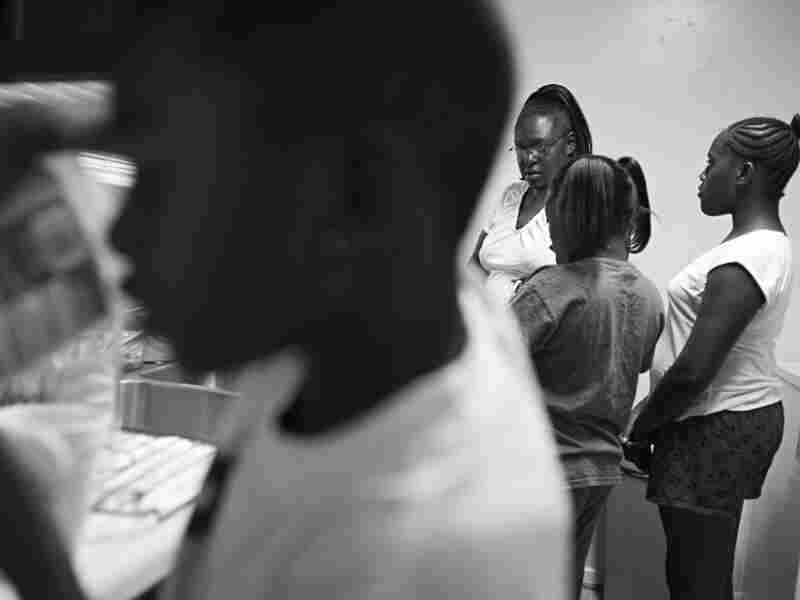 Like, she had to do that in order to take care of her child, to actually be a real mother." When Sullen got the news of her deployment early last year, she called her best friend and, without apology, asked her to quit her job in Alabama and start a new life in Virginia. Sanders plans family dinners every night for her and the children. "This is the least I can do for her," she says. Sanders' son, Darric, pours juice before dinner as Tashawn and Zaria wait for their plates. "Sheena has always been there for me. I couldn't turn my back on her in her time of need." Last November, Sanders and the women's four children watched Sullen board the USS Mahan missile destroyer. "The day that Sheena left, we all get up very early, and it was freezing," Sanders says. "We all tried to act like she wasn't leaving," she says. 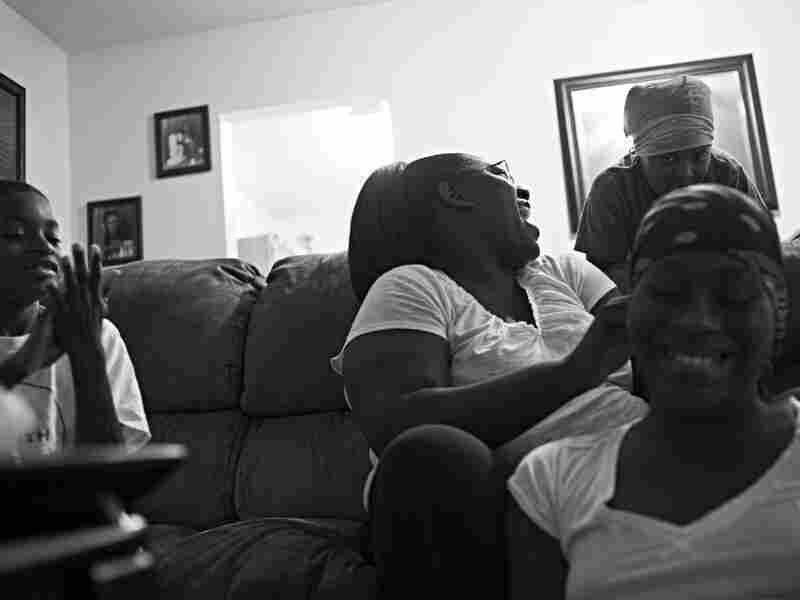 "As we got topsided, me, Zaria and Tashawn started to cry, which made Sheena cry. It was just sad. But I knew she had to do it. It's her job. And she loves her job." For Sanders, it is a privilege to be a temporary mother, as Sullen had been to her. "I never had a mother, so I didn't know what it was like, even how to act like a girl," Sanders says. "I was a tomboy. She showed me how girls are supposed to dress. She listened to me. With her, I knew I would be safe — and I would go the places I was supposed to go." Sanders has been dieting, exercising and getting in shape for boot camp, hoping to finally enlist herself. And they're all counting down the days until Sullen is scheduled to return home, this summer.